This healing lip balm is very simple and very effective. With just four ingredients it yields almost 20 tubes of a gorgeous lip balm that heals and protects. Tip: check out our other homemade lip balm recipe. Over the past few weeks, the weather has turned cold, snowy, and absolutely bitter. It is the kind of weather that seems to freeze away all moisture, especially from my skin. I find that my hands and lips often take the brunt of this cold weather. They often need some intensive moisture therapy to help heal their cracked and dry skin. This year seems particularly hard on my lips. No matter how much lip balm I apply, they just get drier! While I normally make this healing lip balm, I recently purchased some from the store. It looked like it would work wonderfully (with a promised amazing flavor too! ), but it just wasn’t doing the job. After looking at the ingredients I could see why. It was a petroleum-based lip balm, packed with fragrance, flavor, and parabens. While it contained some wonderful natural ingredients, it also contained mineral oil, alcohol, and paraffin. Not really the kind of ingredients that will heal lips. Needless to say, I had to make an ultra-healing solution to my problem. I gathered a few household items and got to work. This recipe is very simple but very effective. Just four ingredients, but each one really packs a punch. Beeswax – This is always a good base for a lip balm recipe because it makes it hard and smooth. Not to mention beeswax is antibacterial and a wonderful natural skin protector. It provides a barrier so that skin stays naturally moisturized. Most beeswax is also lightly honey-scented, providing a subtle sweet aroma. Coconut oil – This is my second go-to ingredient for lip balms. It’s affordable, has a great consistency, and melts when it meets skin. It is antibacterial, anti-fungal, and moisturizes extremely well. Coconut oil also has a high percentage of medium chain fatty acids which are amazing for skin. Olive oil – Olive oil helps this healing lip balm formula to be softer and smoother. 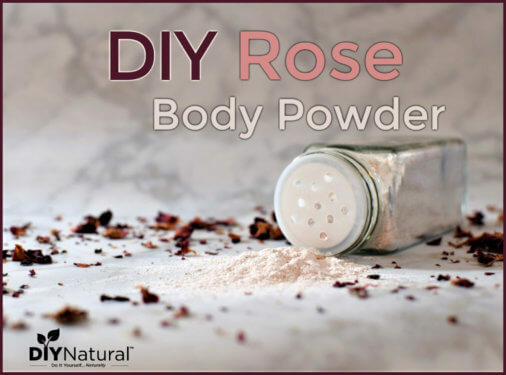 It has been used in so many DIY beauty recipes because it is affordable and an excellent moisturizer. It also contains oleic acid which helps moisture permeate skin layers. Vitamin E – The secret ingredient in this healing lip balm is Vitamin E oil. 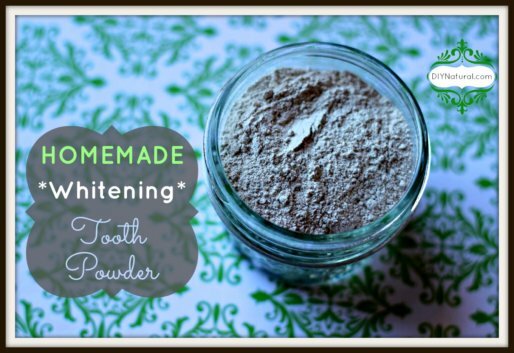 Most people know about this little vitamin and the wonders it does for hair, skin, and nails. It is an antioxidant that helps destroy free radicals, giving it many anti-aging properties. It works extremely well to restore moisture to the skin. You can purchase liquid Vitamin E to add to your DIY beauty recipes. You can also puncture the liquid Vitamin E capsules, but I find it much easier to buy one-ounce vials of the liquid. Just be careful that your Vitamin E is 100% pure, without any other added oils. There’s nothing else to this recipe. 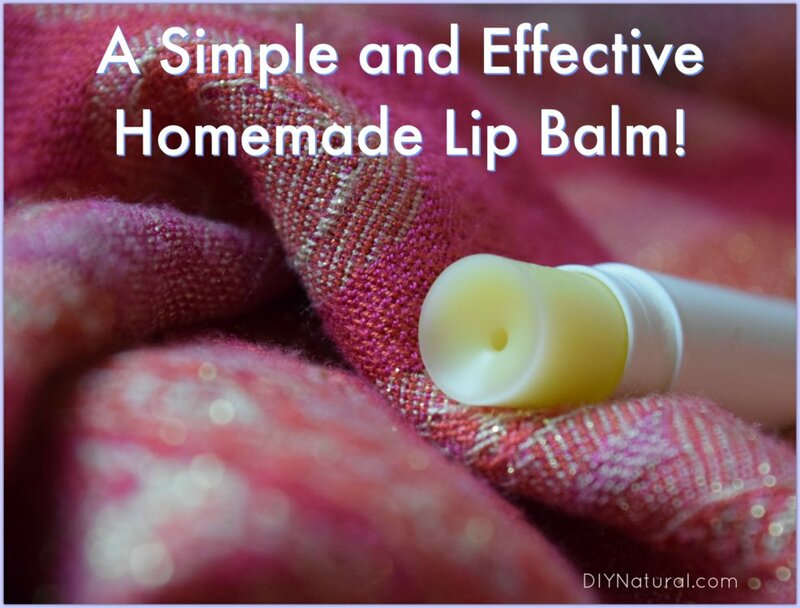 It is so easy to make, and with just a few ingredients I had almost 20 tubes of healing lip balm! Talk about a great value. My husband even takes one of the lip balm tubes to work with him to apply to dry areas of cracked skin on his hands. Microwave another 1-2 minutes or until beeswax is completely dissolved. Carefully pour into lip balm tubes (I needed 20 tubes) or other heat resistant storage containers (like these small tins). That’s it, you just made your own healing lip balm! I always prefer a harder lip balm, so I chose to make mine with .5 ounces of olive oil. I’ve made the same recipe with 1 ounce of olive oil and it turns out much softer, but still wonderfully moisturizing. I made this, and it is awesome! It was the perfect degree of hardness/softness and goes on really smooth. Some of the recipes that I’ve tried in the past have had a grainy texture in some spots. This seems to have a nice texture and I don’t anticipate any problems! I added 1/4 teaspoon pure vanilla extract, but it didn’t make a difference, so I added 1/4 teaspoon more. It gave it a very slight flavor, but I was concerned about adding too much liquid to the mix, so I stopped. I just made this recipe with Plant Therapy peppermint EO. I used a Pyrex on the stove as a double broiler and it turned out great! The Pyrex with a pour spout was perfect for no mess and easy clean up. Super simple ingredients and easy to make. My little one loves it too. Thank you! Nice recipe. I’ve been making mine with cocoa butter, Shea butter and beeswax, which can get a bit too firm. Going to try your, hold my current one for warmer weather. Also, I was making a lot of mess trying to pour my lip balm into the tubes. I discovered that leaving the Pyrex cup in the water bath withe heat off and using a syringe was very easy and a lot less messy. I still had a couple from when my son was smaller. Draw up 5 ml or so, inject into tube, you’re done! A turkey baster also works well if you don’t have access to a syringe! If you are trying to go all natural, wouldn’t you prefer to use something other than a plastic tube to put your lip balm in? If so, what would you suggest? Do you know where I can find a conversion chart for your recipe? I don’t have a scale but have other measuring tools. Also, the last time I was at the store, I had a hard time finding Vitamin E oil, I read somewhere that the t-50 was the best for use in cosmetics, but there’s just sooooo many different types and brands I don’t know which is the right one. Is there a real difference between them that I should be aware of? Like is there a difference between cosmetic grade oils and say something you’d eat? Thanks. I am allergic to beeswax on my lips but would like to make homemade lip balm. What could I substitute for the beeswax to create a firm balm? The other ingredients are fine. Hi Sarah – you could try soy wax, carnauba wax, or candelilla wax (vegetable wax). All have a little different consistency and some may be slightly harder or softer than beeswax so you’ll have to do a little trial and error. Hi Katie, I just read your soap making 101 tutorial. It was so well written, concise and I loves how you had everything you need available to purchase. 🙂 I cannot wait to try, I have never made soap before and I am glad I found your article. I feel well prepared. I little nervous about the lye but I will get over it. I just have little important rules written out. For me, when weighing for a recipe, I try to use the method that will stay the most consistent. I generally use a small electronic kitchen scale to weigh ingredients by volume or weight. But if you can get consistent results using tablespoons, then stick to what you know. Hope that helps! Thank you so much.. How long does this lip balm last?? Your response will be greatly appreciated. Thanks again.. This lip balm should last a few months with daily use. I made mine a month ago and it isn’t even half gone yet! As for expiration, that depends on the shelf life of your coconut oil. It should be a few years at least. What do you have for night time dry mouth, due to early onset of allergies. Also something for dry nasal passages from commercial nasal sprays for seasonal allergies and from commercial allergy medications. Hi Katie, would you recommend adding more beeswax to make it firmer? I made some and loved it but one of my sons wanted it a bit firmer. Yes, add more beeswax for a firmer lip balm. My husband likes his firm as well, so I generally add 0.2 ounces to 0.4 ounces more for him. Are their any sunscreen properties in this recipe? If I recall correctly, coconut oil does have some sunscreen properties but I am not sure of the amount. Are the ingredients measured by weight or volume? Weight – I used a digital scale and weighed each ingredient on the same setting. Can you add essential oil to flavor the lip balm? If so, how many drops do you recommend for this recipe? You certainly can. I would add a non-phototoxic oil that is mild, like Lavender, Helichrysum or Bergamot. 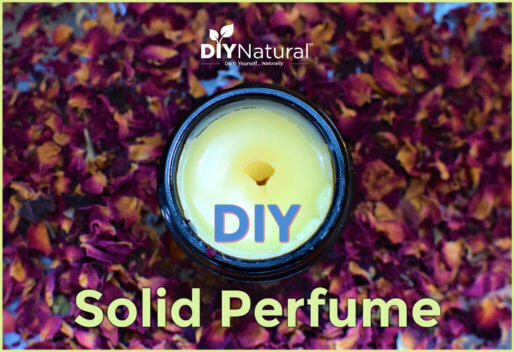 4-5 drops would be sufficient for this recipe – 5-10 drops if you really want a strong scent. Essential oils really don’t impart any flavor, so if you are looking to flavor you can add a food-grade extract (like Peppermint, Lemon, or Almond). You will just have to stir very well to get them to incorporate fully. A little goes a long way! Great! Thank you, I will try the peppermint extract! I really enjoy your DIY recipes! Look forward to reading more! Thanks a million. The recipe will b of tremendous help to me. GOD bless u. What do you recommend for substitutions for coconut oil for people with nut allergy? I may be wrong and you could confirm with your doctor, but coconut is not in’nut’ category as in peanut, pinenut, walnut etc. Its a type of fruit actually. I have concerns about the use of micrwaves. I believe that they change the molecular status of ingredients and therefore are no longer the good healthy ingredients that you started with. I will use the good old tried and true method of using my faithful double boiler handed down from my Grandmother. Thank you for wonderful site and terrific recipes. God bless and keep you. You as well, Katie! A double boiler is an excellent choice and will work just fine.